Every business owner or a corporate sales head knows that getting work from a field sales rep/executive and controlling him is the biggest challenge. To be successful doing this, you must address it with 360-degree view of the problem. Any short-sighted approach would not only be unsuccessful, but also lead to wastage of money and time on the field sales force without yielding results. This article summaries the 10 attributes and issues that you must consider while considering a successful field sales tracking app for your business. Always member – the most intelligent and sharp boy in school would be the naughtiest. But if you can give direction to that naughty boy, he can become the best performer. So, while managing your field sales reps, look at them like naughty students in class and your role should be that of a teacher, who wants to give them direction and turn their energy in the right direction towards sincerity, results, and performance. Every human being is upmost selfish by nature. Therefore, if you prove to him that a particular path is decisively in his interest, he would definitely be motivated towards it. So, if you find that the sales reps are not spending time in the field visiting clients, there as to be a reason for this. And if you can change those reasons successfully, the change in the behavior of field reps would also happen definitely. If you can show him that his interest is no more served by being mischievous, he would fall in line. But that realization should be genuine and obvious. To achieve the desired objective of behavior change, your sales tracker software and app should be powerful. In fact, it should create a comprehensive framework for your field sales team so that every sales rep feels that his own interest would be served only by engaging with customers on fields sincerely; and not by avoiding work; or by manipulating his visits, orders and other KPIs. 4. Why field reps have manipulative behavior? Why a field sales rep is tempted to do all kinds of mischief and nasty things? Why such manipulative behavior is so common amongst field sales reps/executives? Let’s accept that they are also human beings and to be tempted is a common human weakness. Likewise, the sales rep also get tempted by short-term gains. They get tempted, they manipulate short-term and are able to get away with it successfully. So, the deviant behavior gets reinforced and also spreads to other newly joining reps in the team. 5. Strong mechanism needed to capture the deviant behavior with certainty. The successful software or system must capture the deviant behavior of field reps and show to them immediately that any such act won’t go unnoticed. And it should happen in a routine, ongoing manner without any conscious efforts. For example, if the app provides for reliable location tracking of the field rep and doesn’t give any scope to him (e.g. by offline mode or by turning off GPS) to escape such tracking, he would gradually realize that he can’t misstate his location to his managers/supervisors. 6. Just tracking the location is not enough. To achieve this objective, just getting the data about the rep’s location all around the day won’t be sufficient. 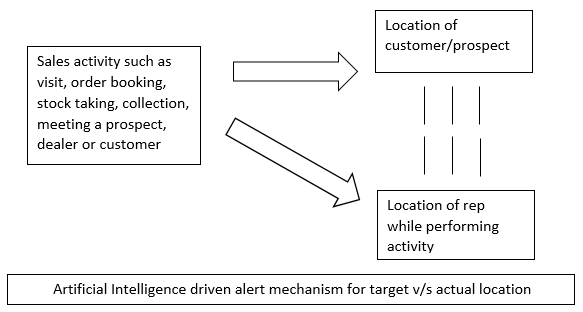 The software should have an inbuilt mechanism to match the location of his target customer/prospect with the actual location of the rep while performing the activity, and it should automatically send alert/notification to the manager whenever there is a discrepancy. There are several apps and software in the market that claim to provide GPS location tracking of field sales reps. But if the AI based intelligent mechanisms are not available to monitor the target vs actual location mismatch, the purpose won’t be served. As a business owner or a sales head, you will never be in a position to monitor the geo-location of a sales rep by yourself and check whether those locations match with the target locations. So, it is an essential feature of a successful field sales tracking app that it should do that task for you and also communicate it to all the stakeholders. Unfortunately, most of the apps available in the market today fail on this essential criterion. While most of them are capable of capturing location-related data, but they don’t have the data mining capabilities to draw meaningful interference from such numerous data. 8. Build the trust to watch them with transparency. Once you adopt the right app and tool, gradually the field reps will start trusting that they are being watched, but being watched ‘transparently’, and being watched for ‘their own benefit’. To be successful in the mission of managing field sales rep, these are the two words – ‘transparency’ and ‘benefit of reps’. These two words are going to be as important as the tools themselves to track their location. These two things would make sure that the entire initiative doesn’t become counterproductive and that the reps accept the new environment with positivity and enthusiasm. 9. Capture the efforts and output independently. Once the sales force tracking software is implemented, it should assure the reps that if they work with sincerity and commitment, they will be rewarded in a predictable and transparent manner. So, the sales forces tracking app should provide a sensitive mechanism to capture each and every effort and input made by the sales rep. It should effectively capture both the effort and the output independent of one another. The field sales reps spend the whole of their day visiting the prospects, customer, and dealers from one location to the other. And the sales targets given to them are not easy to achieve. This leads to considerable stress in their lives. Many times, a target is not achieved in spite of best efforts put in by the sales rep. The sales rep activity tracking software must come to his rescue in such situations when he has put in his efforts but somehow, the results have not been achieved. And such activity tracking should happen in a transparent manner where the same version of data is visible to both the rep and the manager simultaneously. The rep should also be assured that if he puts in his efforts in a predefined manner; he won’t be held responsible if the results are below par. In this way, a field rep tracking app can take away lots of stress from the mind of an honest and sincere guy and he would able to pay full attention to the customers & prospects whom he is visiting. In other words, the app should rebuild the missing trust between the sales rep and his manager so that the time & energy spent in interrogation and cross-questioning is diverted to productive selling activities. If I make sincere efforts, I would be acknowledge of irrespective of the outcomes. Most of the apps available in the market go blindly about location tracking and don’t visualize this emotional but critical aspect of sales force management. To act as a passion catalyst, the app must have a great user interface, should engage with the reps and guide them for success. It should be so intuitive and engaging that the rep loves using it and takes pride in showing it to his customers & prospects. For this reason the look & feel, and navigation of field sales management app is of paramount importance. So, never ignore the ‘look and feel’ of the software since it can be the best ‘passion magnet’ for your sales reps. This would have tremendous impact on success of your sales force management solution. At SalesTrendz, we did great research in the behavioral pattern of field sales reps by collecting data from 12 different industries and by surveying 1496 field sales reps and their managers. The results showed that the majority of the field sales reps are neither too sincere and committed, nor they are mischievous & deviant. Only a minority percentage of the sales reps belong to these two extreme categories. The great majority belongs to the average of the ones who follow the middle path. If your field force tracking software can provide a framework to engage effectively with that majority category, your job is almost done. For this to happen, the app should be built not only on track; but also with a vision to generate trust with transparency as discussed earlier. Your strategy for the minority on the negative side (shown on the extreme left in the above graph) should not be to change them; a change is not likely to happen easily in their case. And each of these mischievous employees can pollute the environment and spoil other sincere workers. These are also the people who spread skepticism about the new initiatives taken by the management to improve efficiency and productivity of field sales reps. So, when considering the successful field sales solution, you must find that it should be robust and should not get manipulated by these deviant reps. The data and decision engine should be reliable and trustworthy. Once that happens, the deviant reps would either say ‘NO’ by themselves and they would show their unwillingness to use the app. Even if they agree to use, the app has inbuilt mechanisms to identify the crooked & mischievous sales reps. These are the ones who would make an attempt to tamper with the GPS location or manipulate other KPIs. But the most important thing would be the determination on part of management to weed out the mischievous elements decisively. Any weakness on part of the sales manager in this regard would prove very costly at a later stage and could result into a failure of the entire initiative, which is neither good for the reps and nor for the organization.